Was very busy, the pub seemed okay but let down by poor service - staff not served in order which always takes the gloss off even of the best of ales. Also the locals seemed a bit 'League of Gentlemen' . Certainly not worth going out of the way to. 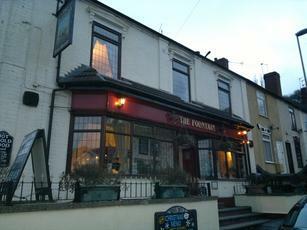 This pub was once a thriving place with a good atmosphere and a variety of good beers, and reasonably good value food. This is not the case now, and I refer to "madmom"s post above. It has certainly sat on it's laurels for far too long. The landlord/owner has not re invested in the place. The decor is shabby, and for saying he runs a restaurant there the toilets are nothing short of squalid. In the Gents the hand dryer is not fit for purpose, even when it works! It's just a gesture and should have been replaced over a year ago with a proper machine. No towels, paper or otherwise are provided. Don't visit in the winter, if at all. I've seen people eating with their overcoats on shivering. Most sensible people leave! The staff seem to be denied using their initiative, by putting a gas fire on. When asked the answer's always "oh I'm not allowed to put it on"
It's very clear that the landlord/owner is running the pub solely for his own pocket and doesn't give a damn for his customers, which are drifting away to the competition. Went in yesterday & still the usual boring 7 uninspiring selection of ales they have had since I started using it over 10 years ago, don't think I'll bother again, it is surrounded by better, and better value pubs. This one should be a lot better than it is. There's a good choice of pubs nearby, including some of the best in the country, but this, despite being in a promising location, seems content to rest on its laurels and not try making the effort to turn good into great. Ten handpulls, and the bers are well kept but a place that's been a GBG mainstay for as long as this has should be a bit more adventurous - you can get most of them in Wetherspoon's. You're better off getting the bus to the next stop (or walking twenty minutes) and going into the Crispin or the Brit. Not bad - but I have been in better pubs. A fairly good selection of beers although the Greene King rep had obviously done his job well!! Just the one pint and then off down the hill. I would probably use this place again but will not go out of my way - it's OK but that's about it.